What to bring, Hotels, Arrival and much more. While planning your visit, what should you expect to happen? How will you fly in? Will someone meet you? What all happens to help make this the best Tarpon vacation of your life? • Inclusive bar – Included beverages are locally available soft drinks, Costa Rican beer (Imperial, Imperial Light, Kaiser non-alcoholic beer), Costa Rican rum (Ron Rico and Cetenario Selecto anjeo) and the house red and white wines. Call liquors are still only $5 a drink and other locally available beers can be requested when you book your trip (see Special Requests) The drinking age in Costa Rica is 18 and Silver King Lodge neither promotes or tolerates underage drinking. • Other available amenities include our pool, the hot tub, and sauna (due to our remote location maintenance factors beyond our control sometimes happen). Lightweight fishing clothing; breathable rain gear; high SPF avobenzone-free sunscreen; bug spray; fast-drying footwear, a hat or cap that provides ear protection; any medications (including over-the-counter); and whatever items you find make your fishing enjoyable (see tackle section about brining your own). Pack light and use our laundry service! For all flights to the lodge, baggage limits are a 30 pound (13.66 kilo) carry on and a 10 pound (4.5 kilo) personal item. Luggage exceeding that may not physically fit on the plane and may be subject to excess baggage charges. In that case, Viajes Garmendia can store excess baggage at no cost or bring it by road at cost. For any purchases at the Lodge (shirts, sundry items, massages) we accept US dollars. We strongly suggest cash. If you need to use a credit / debit card, it will be processed telephonically in the US at our sister business. ATTENTION: Businesses and banks in Costa Rica will not accept torn, marked or damaged US currency. Tell your card issuer you are traveling to Costa Rica! While US dollars (USD) are accepted almost everywhere in Costa Rica, you will get change in colones (CRC) and everything will be converted at whatever exchange rate the business uses and may lose up to 10% or more on each purchase. In San Jose (or anywhere in Costa Rica except Silver King Lodge) it is better to pay in colones in restaurants, etc. The best / easiest way to get colones is to use a bank ATM – otherwise change USD to CRC at the upstairs airport bank in Juan Santamaria International or a casino. Do not use airport currency exchanges or buy CRC from your bank! The exchange rate will be terrible! Most Costa Rican bank and casino ATMs also dispense dollars. Make sure your card issuer has been informed that you are going to Costa Rica or the transaction will be declined. The ideal time to get to an ATM machine is on the way to your hotel. The Viajes Garmendia driver will make this happen if you tell him early. Ask us about withdrawal limits – and don’t forget to tell your card issuer you are traveling to Costa Rica! 1. As you leave the plane, follow the signs to immigration – got your passport? 2. Then to baggage claim. At the entrance to baggage claim you will see a representative of the CANATUR tourist association who will have your name on a white board. They will give you a name label so the driver from Viajes Garmendia can recognize you. Stop and get your label. This is how your Viajes Garmendia driver recognizes you. 3. In baggage claim there are porters there taking the bags off the carousel, so you may find your bags on the side of the carousel. The porters are looking for a tip, but there are also free luggage carts. 6. You will exit the airport and there will be a Viajes Garmendia driver holding a SILVER KING LODGE sign there to meet you. If for any reason, you do not see someone there to meet you, please call Jose Garmendia at 506-8302-6221 or 506-2294-0004. Please remain in the area! You should pack light when going to Silver King Lodge. We have free laundry service for your convenience. You will have a laundry bag in your room. When you are ready to have your clothes laundered, please put your bag on the hook outside of your door and when you return from fishing, your clothes will be neatly folded on your bed. Generally you don’t need more than two lightweight, fast drying fishing outfits, one or two ‘fishing camp casual’ outfits for evenings, a swimsuit and whatever you sleep in. You will be taken to your hotel from the airport. - this is approximately a .5 to 1.5 hour trip for hotels in central San Jose depending on traffic. If you're delayed for any reason - please call Viajes Garmendia at 506-8302-6221 or 506-2294-0004 and they will call your hotel for you and make any necessary arrangements. You will have the remainder of that day to enjoy the sight and sounds of San Jose. Viajes Garmendia can arrange that. Whatever you want to do in Costa Rica, we can probably give you some ‘on the ground’ pointers. Or find someone who can! Your hotel in the greater San Jose area is not included in our package. The link below gives a number of hotel options including our recommended hotels (Silver King Lodge does not recommend hotels that we have not personally stayed at or that do not meet our standards). • Recommended Hotels in Downtown San Jose. IF YOUR FLIGHT ARRIVES EARLY ENOUGH there is the option to fly directly to Silver King Lodge. To do this, you must clear Immigrations and Customs and be outside the terminal by 12 noon. If your flight is delayed or there is a significant delay at Immigration and you miss the SANSA flight that afternoon we can transport you that afternoon by road. Additionally, you may ask us to arrange a charter flight which may be able to depart later (additional cost may be involved). Ask about the details of this option when booking as arrangements must be made well in advance of arrival. Missed flights may incur additional costs. 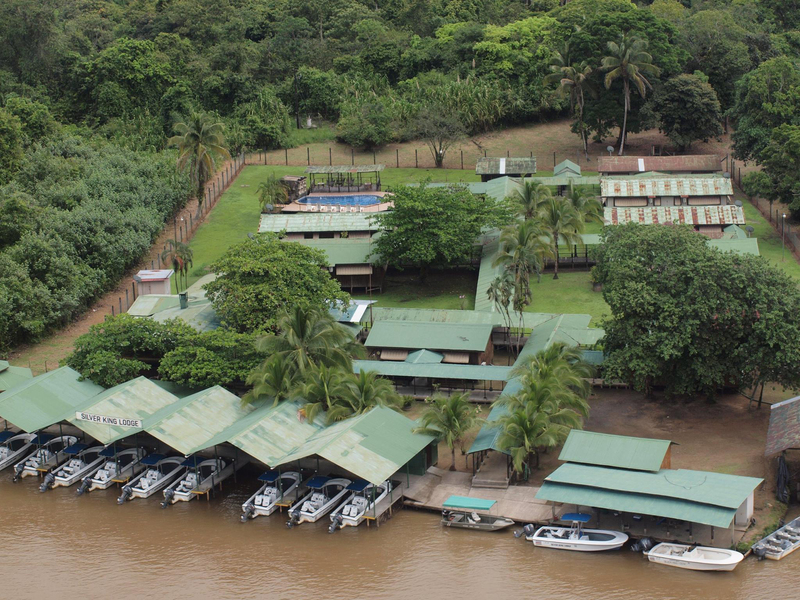 Upon arrival to the Barra airstrip, you will be met by Silver King Lodge's host and your personal fishing guide. Then it's a quick 5 minute boat ride up the Rio Colorado to Silver King Lodge. Upon arrival, we go to the bar for breakfast, check in and orientation while your guide takes your bag to your room. At this time, you will complete your fishing license. There is a $25.00 USD fishing license fee in Costa Rica. This license is an annual fee and expires every April 1st. If you have been fishing in Costa Rica within the year, your license will still be active. Silver King Lodge provides top tier fishing rods and tackle optimized for our fishery, but guests are always welcome to bring their own rods and tackle (this may incur extra transport costs up to and including a charter aircraft and Silver King Lodge is not responsible for losses or damage). Your guide will provide you with a fully stocked tackle with proven lures for our local fishery. Lost lures are replaced at our cost. Broken or lost rods (including reels) are replaced at the “in-Costa Rica” cost. We have a fully stocked tackle shop specializing in the lures that work in the Rio Colorado, inshore and off-shore. We have hand-made Costa Rican crafts and Silver King Lodge apparel available. We also stock a variety of necessities and avombenzome-free sunscreen. If you want to fly fish – especially for tarpon, please bring your own tackle – we have limited fly tackle (optimized for our unique fishery and our big tarpon!) available on a first come, first served basis. Proven flies are available in our tackle shop. Ask us for tackle recommendations from our experienced guides. Silver King Lodge is glad to consider all special requests. Sometimes we are unable to accommodate them because the requested item is just not available in Costa Rica or the lead time is too short. Where the request incurs costs over-and-above and we can meet it, it is done at our cost. Please enquire. The drinking age in Costa Rica is 18. Silver King Lodge does not allow or condone underage drinking. We supply beer, soda and water in the boats daily for guests. The beer in the boats is limited due to safety concerns. At the bar, local beer and local liquors are inclusive, with call liquor available. Therapeutic massages are available by appointment. Silver King Lodge has two masseuses available who can do 4 massages each daily. Book these early onsite with the manager. Housekeeping staff: $8.00 per day per guest. Kitchen staff: $12.00 per day per guest. Bar staff: $5.00 per day per guest. *When three anglers fish together, we recommend tipping the guide more. Please bring clean, undamaged small bills free of any marks*, as we are limited with change. We recommend tipping your guide at the end of your trip. This information is also in the guest guide in your room, along with envelopes. Please tip the staff directly. *Business in Costa Rica will not accept worn, torn, marked or damaged US currency. Please tip with new bills. We have extremely limited change on hand. We’re sad to see you leave! Please leave your key in the door and leave your bags outside your door when you go to breakfast. Your departure time is based on your flight schedule – and that of the other departing guests. Normally SANSA flights depart our airstrip between 0700 to 0730 (7:00 to 7:30 AM). We can try and schedule an afternoon flight to San Jose if you want to get in a morning’s fishing. Ask about this when booking. If you are leaving Costa Rica that day, please schedule your departure flight in the afternoon, in case of delays. Silver King Lodge is not responsible for missed flights. Arriving in San Jose, you will be met by a Viajes Garmendia driver and transported to your hotel or to International departures. If you are staying over and want Viajes Garmendia to take you to the airport, please arrange that directly with Viajes Garmendia. Remember, when exiting Costa Rica, there is a $29.00 USD per person exit tax. Most airlines now include this in their ticket. If your airline doesn’t there are counters on the right and left, just as you enter the airport terminal. These lines look long, but will move quickly.